Are you looking for information about breast surgery? You have come to the right place. We detail all varieties of plastic surgery, cosmetic surgery and reconstructive breast procedures. We feature in-depth information on breast augmentation, breast reduction, breast reconstruction and breast lift, as well as everything there is to know about breast implants. We also fully explain the diversity of nonsurgical breast enhancement methods that are available. We pride ourselves on providing easy to understand guidance for all your breast health needs. Although we focus on breast surgery techniques, we also provide a comprehensive look at general plastic, cosmetic and reconstructive procedures for the face and body. We share all the latest research about the safety and efficacy of every plastic surgery treatment option. Our awesome book, Better Breasts Without Surgery provides priceless guidance on the safest and most effective ways to nonsurgically increase or decrease breast size, as well as lift breasts without surgery. 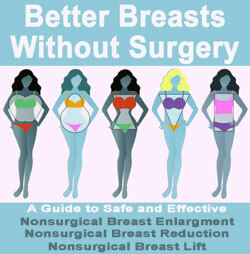 If you are considering any type of breast improvement procedure, you must read this book before doing anything. Doctors are invited to join our Plastic Surgeon Directory and be seen by millions of prospective patients. Our website is a leading resource for breast cancer information. In fact, maintaining optimal breast health, while preventing disease, is our main focus. We invite you to explore our breast anatomy section to learn all about the human mammary organ, so that you can fully appreciate the miracle of the breast and its amazing functionality. Our mind-body-spirit approach to breast health is unique. Breast issues might appear physical, but their emotional ramifications permeate far deeper into the mind of every woman. Therefore, we provide a truly unparalleled look at the psychology of breast surgery. Plastic surgery is a true form of mindbody medicine. We want you to understand the facts concerning plastic surgery. We highlight the positive aspects of each therapy, but also provide a balanced view of the possible negative consequences of treatment. Most importantly, we provide an honest analysis of the risks and possible complications associated with each method of care. Let us make it perfectly clear that we are not trying to convince you to have surgery, nor are we trying to sell you on any product or service. Instead, we provide the latest objective news concerning plastic, cosmetic and reconstructive surgery, focusing primarily on breast aesthetics. If you are seeking information about any type of breast surgery, breast implants or breast health, or if you are just researching general plastic and cosmetic surgery offerings, we can help you by providing trusted research that has guided millions of women to make informed decisions. The navigation bar contains the incredible diversity of topics featured on this website. We recommend that you read all the articles in each section in order to best understand the complete view of each topic as a whole. Looking for something in particular? Please use the site search feature to find any word or phrase. You can also utilize our site map to find the topics that interest you most.